Flow magazine is a quarterly magazine full of inspiration and insights with a focus on celebrating creativity, imperfection and life’s little pleasures.Buy a single copy or subscription to Flow magazine. 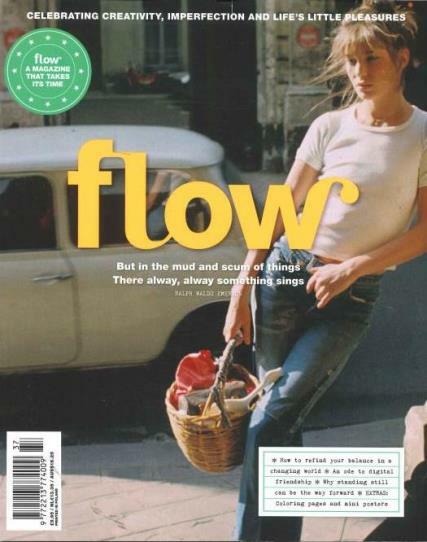 Flow Magazine launched in 2008 and has had continued success growing globally. The very first issue started with the sentence “The best things in life happen when you dare to follow your intuition.” Which has continued to be at the forefront of every issue printed since. Feel Connected: Get – and be – in touch with the people and the world around you. Live Mindfully: Experience the conscious life. Spoil Yourself: Take a little time for the things that make you feel good. Simplify Your Life: It need not be so complicated. Flow Magazine is for women of all ages who love anything paper. Its readers are down-to-earth, creative, lifelong learners and enjoy making things by hand. They prefer to read about people who live similar lives instead of reading about mainstream trends, beauty and fashion. A great magazine with great pages and stories. My daughter, a professional artist, finds this magazine both interesting and inspiring. Absolutely love the unique quality of this magazine. It's the only magazine I've ever read cover to cover. My wife loves the magazine, very high quality magazine. "Flow" is the most unusual magazine I'vr ever seen. It is so much fun to open it up and see interesting lifestyle articles side-by-side with arts & crafts materials that you can pull out and use! Too much fun! This magazine is like no other. It's creative, fun and uplifting.